Yesterday I appeared at a Heritage Foundation event where Sen. Kay Bailey Hutchison (R-TX) discussed her Social Security reform plan. Following her presentation, I provided some comments along with David John of the Heritage Foundation and Jason Fichtner of the Mercatus Center at George Mason University. The argument for cutting the payroll tax in the first place — and Summers' argument now — is that the fragile economy still needs stimulus, and boosting take-home pay for virtually all working Americans is an effective way to do it. Don't be fooled. What is billed as a stimulative cut in payroll taxes is really budgetary malpractice on the order of diverting money that's supposed to go into your 401(k) account, or your kid's 529 college savings plan, to pay for current expenses. It would only make sense as part of a broader accord to stabilize Social Security for the long term, which so far has proved too politically unpalatable for either party to swallow. Absent such steps, extending or expanding the payroll tax cut would just add to the nation's debt problems and further weaken the Social Security system just as the program faces unprecedented pressures from retiring Baby Boomers. It's the height of irresponsibility. I buy USA Today's argument that payroll tax cuts covered up with general revenue transfers undermine the notion of a self-funded Social Security program, although what we're seeing now isn't substantively all that different from the so-called "raid" on Social Security we've seen over the past three decades, just a little bit more overt. The Post's Fact-Checker gives the coveted four Pinnochios to the AARP's commercial arguing that, instead of reducing entitlement spending, the Congress should focus on earmarks such as poetry at zoos and treadmills for shrimp. I'm no fan of shrimp treadmills (and presumably neither are the shrimp, lazy creatures that they are), but it's a joke to think we'll balance the budget this way. We do need to cut earmarks and other wasteful spending, since each dollar of waste that's allowed to continue is an additional dollar we need to cut from Social Security or Medicare. But any serious budget analyst knows that entitlements are where the money is and it's misleading to tell people otherwise. The AARP ad perpetuates the worst stereotypes about how easy it would be to balance the budget. At a time when the nation's fiscal crisis — amid the looming retirement of the baby-boom generation — demands informed and reasoned debate, the AARP misinforms its members about the choices the nation faces. The choice is not between shrimp treadmills and Medicare; the question is how growth in the big entitlement programs can be restrained to accommodate the baby-boom generation without harming the elderly already receiving benefits. If AARP has identified real spending cuts worth $100 billion, it should have made an ad promoting those ideas, not an ad perpetuating myths. Four Pinnochios, the Fact-Checker's highest dishonor, which signifies "Whoppers." Good job. Upcoming event: Should Social Security’s Cost-of-Living Adjustment Be Changed? The National Academy of Social Insurance will sponsor "Should Social Security's Cost-of-Living Adjustment Be Changed?" Some recent deficit reduction proposals call for shifting to a "chained CPI" to adjust Social Security and other benefits to keep pace with inflation. Other policy proposals call for using a special price index for the elderly to adjust Social Security benefits. What are the implications of such changes? This session will feature a discussion of the Academy's recently-released fact sheet: Should Social Security's Cost-of-Living-Adjustment Be Changed? Register now to get answers to your questions about these policy proposals. What is current Social Security policy on cost-of-living adjustments (COLAs)? Are other consumer price indexes (CPIs) available? 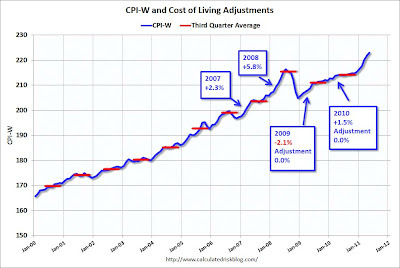 What is a "chained CPI"? How would it affect seniors' benefits? How would it affect Social Security's finances? How would switching to a special CPI for the elderly affect benefits for seniors? How is it likely to affect Social Security's long-term finances? How do living costs of seniors compare to those of other households? How does out-of-pocket health spending for seniors change as they grow older? Attendees will receive copies of the fact sheet, Should Social Security's Cost-of-Living Adjustment Be Changed? as well as NASI's new primer, Social Security Benefits, Finances, and Policy Options. Over at AEI's Enterprise Blog... Read more! Calculated Risk has a nice post on the rise in the CPI-W, the measure of inflation used to calculate Social Security COLAs. After several years in which the CPI remained below its historical high, meaning that no COLAs would be paid, a surge in prices over the past year -- presumably driven on the food and energy sides -- means that a COLA is likely to be paid in January, 2012. 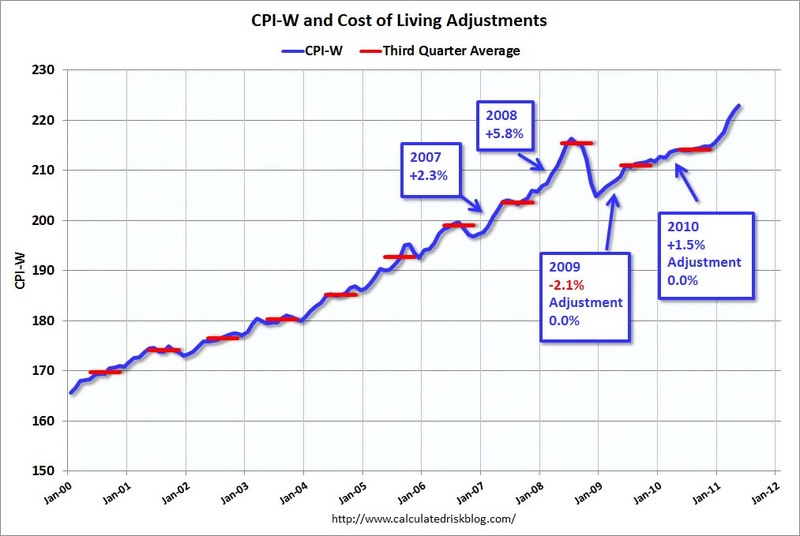 Here's a nice chart showing the CPI, marking the points where COLAs were calculated. The bad news: this also means that Medicare Part B premiums will go up, since for most people they can't rise in years without a COLA. Also, the maximum taxable wage -- currently $106,800 -- will rise as well. Check out Calculated Risk's post here. Read more! The Joint Economic Committee's Republican Staff has released a new staff commentary entitled "Social Security Surpluses: Fiscal Fact or Accounting Fiction?" Check it out here. From Chuck Blahous, one of the public trustees of the Social Security and Medicare programs, over at e21. The Heritage Foundation's David John writes about the Social Security reform bill recently introduced by Senators Lindsey Graham (R–SC), Rand Paul (R–KY), and Mike Lee (R–UT). The Graham–Paul–Lee bill greatly improves Social Security's financial future without tax increases. If it became law, Social Security would still run deficits, but they would be much smaller in the near term and would end permanently after 2052. This is far more responsible than the results of what appears to be the Obama Administration's preferred scenario: perpetual deficits for at least the next 75 years and 22 percent benefit cuts for all after 2036. Hiding your head in the sand, as the Administration has done so far, does not solve a problem. Fixing Social Security requires the kind of leadership that is willing to face facts and make difficult decisions. Have Social Security benefits really been cut by 19 percent? The National Academy of Social Insurance, of which I'm a member, has released a new issue brief titled "Social Security Beneficiaries Face 19% Cut; New Revenue Can Restore Balance." The paper argues that, based on changes implemented in the 1983 Social Security reforms—increases in the normal retirement age from 65 to 67; a one-time reduction in COLA payments; and the taxation of retirement benefits—future retirees will receive benefits 19 percent lower than what they would have received had the 1983 reforms not been implemented. Consequently, NASI argues, well, new revenues can restore balance. Some perspective is needed. First, the 1983 reforms didn't only reduce benefits; they also increased taxes, by covering newly hired federal workers and non-profit associations, accelerating tax increases already on the books, prohibiting state/local workers from leaving the system, and so on. Together, tax increases made up around 38 percent of the total changes in the 1983 reforms, and that's even if you count the taxation of benefits as a benefit cut rather than a tax. How to categorize the taxation of benefits is ambiguous and I can go either way, although I'd note that benefit taxation tends not to affect low- and middle-income retirees very much. (This might be the first time I've seen NASI opposed to taxes on high earners.) Overall, the 1983 reforms were more balanced than you might guess from reading NASI's paper alone. Second, while benefits in any given month will be lower in the future than they would have been under 1983 rules, that doesn't mean they'd be lower in real terms. Because Social Security benefits are indexed to wage growth, they increase faster than inflation, meaning that the typical retirement benefit in 2023, even after these cuts, would be around 30 percent higher than in 1983. You'd much rather get the real benefit levels that Social Security will pay in the future than it did in the 1980s. Third, future retirees will live longer than those in the past did, so while they may receive somewhat lower replacement rates than in the past, they'll collect them over longer retirements. In 1983 the typical retiree lived around 17.0 additional years; in 2023, the typical 65-year-old will live around 20.6 years more. The difference: 21 percent. So what they lose month-to-month, they gain back year-to-year. You could argue that people would want the same replacement rate even over longer retirements, meaning that these almost four extra years of collecting benefits shouldn't factor in. Fine. But the life-cycle theory of consumption says that as life expectancies increase, people will tend to target lower replacement rates relative to pre-retirement earnings. The reason is that longer life expectancies demand higher saving rates during working years, which means that—all other things equal—the ratio of Social Security benefits to pre-retirement consumption will rise. All of this is open to argument. But NASI should show some more nuance in their work; showing one side of the argument in order to push for one policy prescription isn't the way to go when your mission is to promote understanding of the issues. Reforming Social Security will require three things: policymakers to work together, the public to understand the situation and engage and a modest amount of sacrifice from workers and retirees. It will be much easier to address the problem now in a rational and equitable manner than to wait until the crisis is upon us, when much more drastic changes to revenues and benefits would be necessary. By enacting a plan within a year, we can slowly phase in the solution over the coming decades and require only limited modifications. This would allow future retirees appropriate time to adjust their plans for work, saving and retirement. I wonder whether the organization itself – which, it should be noted, opposed the last set of Social Security reforms in 1983 – would be on board for Novelli's ideas. Raise the retirement age, increase the wage cap, and reduce COLAs. Check it out here. "Defined Contribution Pension Participation and Contributions by Earnings Levels Using Administrative Data"
Many observers question how the shift from defined benefit (DB) to defined contribution (DC) retirement plans affects workers with different compensation levels. To advance the empirical basis for understanding pension outcomes, this article estimates DC plan participation and contribution rates in 2006 both by the worker's current earnings and by the annual average of real earnings over the 10-year period 1997–2006. Using earnings data from W-2 tax records linked to data from the Census Bureau's Survey of Income and Program Participation, we find that workers in the lower part of the earnings distribution are less likely to participate in a DC plan, and the contribution rates for those who do participate are lower than those for workers with higher earnings. "Managing Independence: The Governance Components of the National Railroad Retirement Investment Trust"
Congress created the National Railroad Retirement Investment Trust (NRRIT) in 2001 to invest assets from the federal Railroad Retirement program in equities, expecting to improve returns and help fund expanded benefits. In designing the NRRIT, Congress tried to address concerns raised by policymakers and theorists about potential political influence on investment decisions that could create conflicts, lower the program's performance, and interfere with private markets. Proposals to use centralized investment to improve Social Security's financing have recently raised similar concerns. This article reviews management and governance aspects of the NRRIT as they relate to its political independence by focusing on the Trust's legal status, mandate, governing board characteristics, investment policy, and oversight. If Social Security were to adopt such an investment policy, examining the NRRIT's design and experience in these areas could provide useful guidance. "Women and the Social Security Earnings Test"
In 2000, in an effort to encourage older individuals to continue to work, Congress removed the Social Security earnings test, which beneficiaries view as a tax on benefits, for beneficiaries who attained the Normal Retirement Age. Previous analysis on the effects of the Social Security earnings test has not addressed the effect on women, who are a significant proportion of all benefit types – comprising 57 percent of all beneficiaries over 62, 49 percent of primary beneficiaries, and 99 percent of spousal beneficiaries. After the removal of the earnings test, female primary beneficiaries increase average earnings and labor force participation. Female spousal beneficiaries, however, do not increase their average earnings or labor force participation. In addition, the removal of the earnings test also encourages all women to claim benefits at an earlier age. As suggested by Gruber and Orszag (2003), the incentive to claim benefits at a younger age may have an effect on the welfare of Social Security beneficiaries, possibly increasing the poverty among older individuals.